January 8 - Happy Hour Party. Dagmar and The Seductones ring in the New Year as the featured artist on the Ring Bell and LouLou Show on Supertraxx Radio! 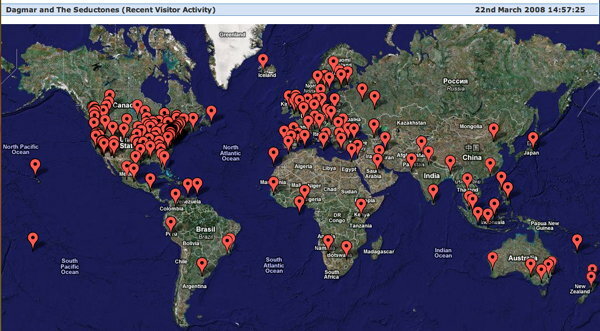 Also on myspace with a Listen Live link. January 31 - Winter Dance Party at the Surf Club Live. 9:00PM. Celebrating the life and music of Buddy Holly. Dagmar will be featured along with other Guest Artists. Each year, the crowd gets bigger, so get there early! Hosted by JP McDermott and Western Bop. featuring special guest JP McDermott. Big old-fashioned wooden dance floor, plenty of free parking, open kitchen, full menu till midnight. It's open to the public. April 18 - Quarry House. 9:30PM - 12:30AM. 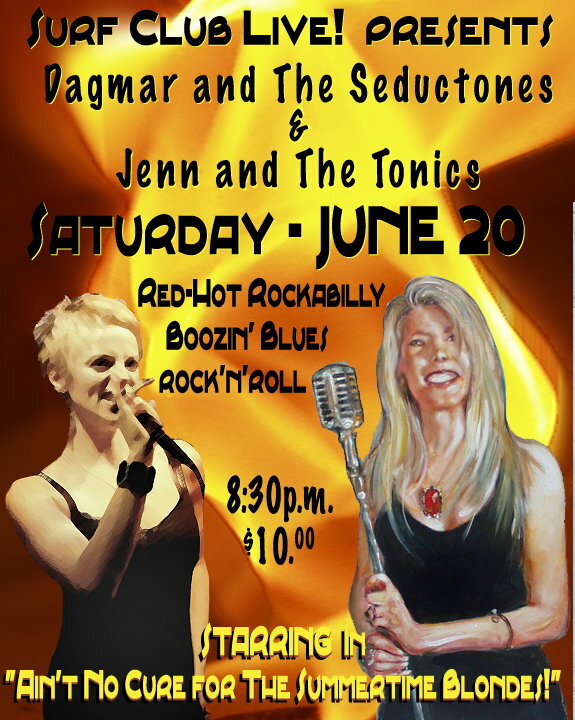 Dagmar and The Seductones bring their sound to the underground at Rockabilly Saturday Night! There's room to dance and great food and drink. June 20 - Surf Club Live! 8:30PM to 12:30AM. Dagmar and The Seductones with Jenn and the Tonics prove that there ain't no cure for the summertime blondes! June 27 - Del Ray Music Festival. 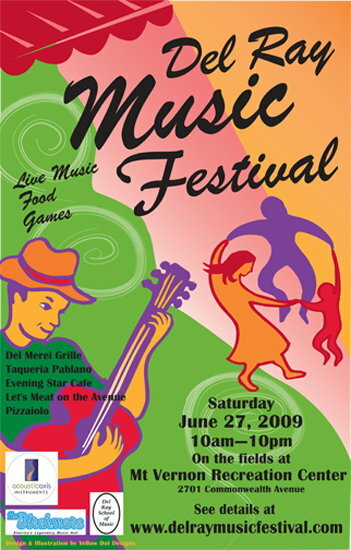 Two stages of music, plus food, fun and games in Del Ray, Alexandria! Dance in the cool of the early summer eve or just watch the action from a comfortable seat on one of the big bales of hay scattered around the field. Sponsored by Del Merei Grille, Taqueria Pablano, Evening Star Cafe, Let's Meat on the Avenue, Pizzaiolo. August 16 - Summer on The Green. 6:30PM - 8:00PM Spend a summer Sunday evening with us! It's our second year performing at this friendly ampitheater situated right smack in the center of town! Bring a lawn chair and settle in for an evening of fine rockin' music! September 24 - Patsy Cline tribute, JV's Restaurant. 9:00PM. Dagmar and other guest stars celebrate the life and music of Patsy Cline. Get there early! Hosted by Honky Tonk Confidential. October 3 - Riverdale Park Day, Riversdale House Museum. At 3:45PM, Dagmar and The Seductones rock the grounds of the historic mansion-turned-museum. Relax and enjoy the day with music, food and more! January 16, 2010 - Concert. Presented by the Family Friendly Concert Series. Doors at 7:00pm, show starts at 8:00pm. Dagmar and The Seductones begin the New Year by rockin' it up at a new venue and a new concert series. Partial proceeds and donations will go to the Southern Maryland Food Bank. Concert Hotline: 301-899-4020. Advance tickets $10.00 (plus service charge). General Admission $20.00 ($15.00 with donation of canned goods) Children 6 and under FREE. Advance ticket outlets: Hot Licks Guitar Shop, Joe's Groceries & Deli, Bullock's Piano Salon East, Island Music Company. Come Back To Me, and our debut, Little Bitta Love, are available for purchase online at CDBaby. iTunes, MusicIsHere, PayPlay, and Tradebit.